I am a yoga and hoop dance instructor and performance artist based in Champaign-Urbana, Illinois. I offer private lessons and group classes in yoga, meditation, hooping, fire safety and fire performance. I share my skills locally and on stage all over the Midwest with the band Sun Stereo, and I am often willing to travel to teach or perform, just ask! If you want to learn about my journey so far, and why I am so passionate about the healing arts that I share, please read on. Moving my body has been an integral part of my life ever since my first dance classes as a child, and I continued with dance, theater, and music throughout most of my adolescence. I picked up my first hoop in 2008, and hooping has been an endless joy and creative outlet for me over the years. It even led me to the path of yoga in 2009, forever transforming my life for the better. 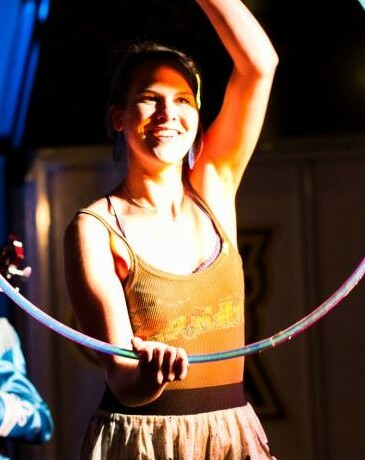 I began street-performing with fire hoops while living in Barcelona in 2011, and I have continually fueled my passion for performance over the years. I have since added many exciting elements to my act, including multiple hoop performance, fire eating, fire fans, silk fan veils, isis wings, and the aerial arts. In 2013, I met the love of my life, partner-in-crime, and best friend, and began performing my acts live on stage with his band, Sun Stereo. Performance and yoga keep me happy and healthy, but having fun while exercising does not come easily for everyone. So many of us struggle with sticking to a workout regimen, but I truly believe that moving our bodies can and should be FUN! We are made to move and studies show that our workout is more beneficial if we enjoy what we are doing! That’s where hoops and yoga come in. Hooping feels like playtime, but it burns almost as many calories as jogging and is much less abusive on our joints. It’s a full body and brain workout, as is yoga! More evidence appears each year to support yoga’s ability to treat and prevent the most common health concerns facing humanity today. Yoga helps us effectively manage stress, the root cause of many health imbalances and chronic diseases. Emotional health is just as important as physical health for building a happy, rewarding life. Through my yoga practice, I gain a clearer understanding of myself and learn to unravel my patterns of behavior and thinking that lead to suffering. Love, compassion, and honesty, both with ourselves and toward others, are the ways to a peaceful, thriving, and sustainable society. I believe that when we loosen the grip of fear and stress on our lives and learn to listen more carefully to our inner voices, the joy that we radiate in our lives, and in our work, spreads and amplifies with each person that we encounter. This is why I share my gifts: to help facilitate this shift in those around me… in a yoga class, by teaching someone to meditate, or by inspiring someone to get healthier, have more fun, and love themselves and their bodies a little more. I know from experience that yoga and the hoop are powerful tools for mental and physical health, personal growth, and creative expression. In order to share these healing arts with as many people as possible, I craft my classes to provide an awakening of the mind and body that is accessible to everyone.